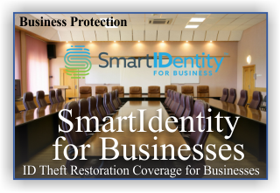 The SmartIDentity Business program provides Small and Medium Businesses (SMBs) with a comprehensive risk management suite of services to detect, prevent and mitigate fraud that affects the business. This includes business identity monitoring services, data breach response and remediation services, and an employee benefit plan including fully managed identity fraud discovery research, remediation and resolution for all employees. to speak directly to a representative.